With std::optional you can represent some Type or nothing. With std::variant you can wrap several variants into one entity. And C++17 gives us one more wrapper type: std::any that can hold anything in a type-safe way. So far in the Standard C++, you had not many options when it comes to holding variable types in a variable. Of course, you could use void*, yet this wasn’t super safe. Potentially, void* could be wrapped in a class with some type discriminator. As you see, we have some basic form of the type, but it’s a bit of coding required to make sure MyAny is type-safe. That’s why it’s best to use the Standard Library rather than rolling a custom implementation. And this is what std::any from C++17 is in its basic form. It gives you a chance to store anything in an object, and it reports errors (or throw exceptions) when you’d like to access a type that is not active. std::any is not a template class like std::optional or std::variant. by default it contains no value, and you can check it via .has_value(). you can reset an any object via .reset(). it works on “decayed” types - so before assignment, initialization, emplacement the type is transformed by std::decay. when a different type is assigned, then the active type is destroyed. you can access the value by using std::any_cast<T>, it will throw bad_any_cast if the active type is not T.
you can discover the active type by using .type() that returns std:: type_info of the type. But maybe there are some legitimate use cases? While I perceive void* as an extremely unsafe pattern with some limited use cases, std::any adds type-safety, and that’s why it has some real use cases. In Libraries - when a library type has to hold or pass anything without knowing the set of available types. Parsing files - if you really cannot specify what are the supported types. Bindings with a scripting language. I believe in a lot of cases we can limit the set of supported types, and that’s why std::variant might be a better choice. Of course, it gets tricky when you implement a library without knowing the final applications - so you don’t know the possible types that will be stored in an object. The demo showed some basics, but in the following sections, you’ll discover more details about std::any so read on. 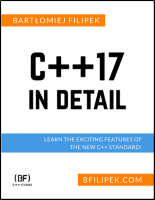 C++17 In Detail by Bartek! The crucial part of being safe for std::any is not to leak any resources. To achieve this behaviour std::any will destroy any active object before assigning a new value. The any object is initialized with MyType, but before it gets a new value (of 100.0f) it calls the destructor of MyType. In order to read the currently active value in std::any you have mostly one option: std::any_cast. This function returns the value of the requested type if it’s in the object. As you see you have two options regarding error handling: via exceptions (std::bad_any_cast) or by returning a pointer (or nullptr). The function overloads for std::_any_cast pointer access is also marked with noexcept. std::any looks quite powerful and you might use it to hold variables of variable types… but you might ask what’s the price of such flexibility? The main issue: extra dynamic memory allocations. std::variant and std::optional don’t require any extra memory allocations but this is because they know which type (or types) will be stored in the object. std::any has no knowledge and that why it might use some heap memory. Will it happen always, or sometimes? What’re the rules? Will it happen even for a simple type like int? Implementations should avoid the use of dynamically allocated memory for a small contained value. Example: where the object constructed is holding only an int. Such small-object optimization shall only be applied to types T for which is_nothrow_move_constructible_v<T> is true. To sum up: Implementations are encouraged to use SBO - Small Buffer Optimization. But that also comes at some cost: it will make the type larger - to fit the buffer. Boost Any was introduced around the year 2001 (version Version 1.23.0). What’s more the author of the boost library - Kevlin Henney - is also the author of the proposal for std::any. So the two types are strongly connected, and the STL version is heavily based on the predecessor. The main difference is that boost.any doesn’t use SBO, so it’s much smaller type (GCC8.1 reports 8 bytes), but as the consequence, it will allocate a memory even for simple types, like int. The core of std::any is flexibility. So In the below examples, you can see some ideas (or concrete implementations) where holding variable type can make an application a bit simpler. In the examples about std::variant (see it here) you could see how it’s possible to parse config files and store the result as an alternative of several types. Yet, if you write a really generic solution - maybe as a part of some library, then you might not know all the possible types. Storing std::any as a value for a property might be good enough from the performance point of view and will give you flexibility. What if we changed this system into std::any, so that a message could pass anything to the handling method? << pos.first << ", "
Of course, you have to define how are the values specified (what are the types of a value of a message), but now you can use real types rather that doing various tricks with integers. The original paper that introduces any to C++, N1939 shows an example of a property class. The properties object looks very powerful as it can hold many different types. As a first use case a generic UI manager comes to my mind, or a game editor. The general gist is that std::any allows passing ownership of arbitrary values across boundaries that don’t know about those types. Download a free copy of C++17 Language Ref Card! In this article, we covered a lot about std::any! std::any uses Small Buffer Optimization, so it will not dynamically allocate memory for simple types like ints, doubles… but for larger types it will use extra new. std::any might be considered ‘heavy’, but offers a lot of flexibility and type-safety. you can access the currently stored value by using any_cast that offers a few “modes”: for example it might throw an exception or just return nullptr. use it when you don’t know the possible types, in other cases consider std::variant. Have you used std::any or boost::any? Can you mention what the uses cases were? Where do you see std::any might be useful?